This report highlights the progress achieved against plans, issues and challenges encountered during the implementation of the project activities in these two project areas during the period. This was done in partnership with government ministries and other beneficiaries. This report looks at achievement of the program, lesson learnt, problems faced in implementation and makes recommendations for the future implementation to achieve the best results. The project planned to monitor the planting of maize crop at Matande by the women and tomato production at Nakutepa center. So far all these planned activities on this program were done as planned. The women of Matande have planted maize at their dimba near the fish pond, and the site at Nakutepa where there is tomato crop was visited and the crop stand was quite good. The communities (committee) have started selling the products and a total of k2,300.00 was realized during that time of visit. - Increased availability of food for the children in the centers of operation. products produced in these centers like sweet potatoes. ￼￼￼￼￼￼￼￼￼￼￼￼￼￼￼￼￼￼￼￼￼￼￼￼￼￼￼￼￼￼￼￼￼￼￼￼￼￼￼￼￼￼￼￼￼￼￼￼￼￼￼￼￼￼￼￼￼￼￼￼￼￼￼￼￼￼￼￼￼￼￼￼￼￼￼￼￼￼￼￼- Farmers growing horticultural crops (Nakutepa) have increased their income through sales of their produce. The project planned to monitor the loan repayment program at Matande center from IGA loan group of the center. So far a total of k279,250.00 was collected and a total of k246,350.00 was banked. This represents 28% repayment. The total of k950,000.00 was distributed to 41 members hence we are expecting to collect a total of k997,500.00 by the end of this loan. It was noted that most of group members are doing petty business ranging from fish selling, goats selling, Makaka (dried cassava), rice selling, maize, groceries, second hand clothes steel plates and maize flower. But it was observed that most of the businesses are run with the help of their husbands and most of the businesses are doing very good. The project planned to monitor livestock program in all the centers during the period. So far all the centers were visited as planned. At Likwanya, total of 3 goat kids 1m, 2 f, at Nsadi 1m, at Nakutepa 1f, and at Matande 2f kids were kidded during the period totaled to 7 kids. 2 mother goats, one at Matande and one at Likwanya were reported dead during the period. More and more farmers are accessing goats in the project areas through the passing on program. As a result, the livestock farmers are becoming less prone to nutritional diseases since they are now accessing high value animal protein. The farmers who have finished passing on to others are able to sell some of the goats to those who are interested to rear them and the proceeds are used for general household needs. Farmers benefited manure for their garden through the program. v Increased livestock holding per family or household. The project planned to monitor shallow well program at Nakutepa and Matande during the period. So far all these centers were visited and the wells are working, and more people are accessing clean water from these wells. We also managed to visit wells at Nsadi and Likwanya centers where their wells are completely dried. Their domestic water is drawn from the nearby rivers that are not of a condition for human consumption. - Reduction in distance covered by women in fetching water, hence time saved is used in carrying out beneficial activities in their homes. - Reduction in cases of water born diseases such as diarrhea and dysentery/cholera, hence people are health and are able to carry out various development activities. 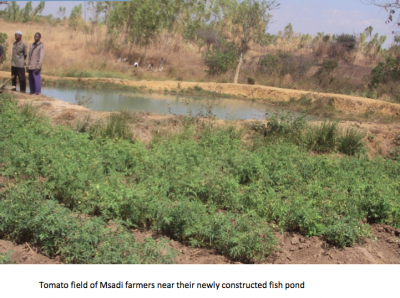 The project planned to monitor the performance of fish program pay the care takers of the fish at Matande and also to monitor the construction of fish pond at Nsadi center in Machinga. So far all these planned activities were done as planned, and the program is massive. With the introduction of workers ￼to manage these ponds, the program is going on very well even water supply into these ponds is quite good, we are expecting to harvest them in October this year. See the pictures of this program below. The project planned to employ one instructor on tailoring program at Matande to take over the position of Mr. Chaffa who was resigned some months ago. So far the instructor has been found and has started her job on 1stSeptember 2013, hence vocational school on this program has resumed. The committee has agreed to pay her k10,000.00 per month during this period of probation and then increase her salary after her probation. See the pictures of this program below. The project planned to introduce vocational school on carpentry at Matande center during the period. So far this program has been done as planned. 2 Instructors were employed for the position. These people will make furniture for sale hence generate money for the center. A total of 12 students were registered for the course. The project has procured a total of 73 pieces of timber for the program. The project will be manufacturing Beds, Doors, Trolleys, Displays, and Sofa set chairs. The project planned to monitor the performance of the program at Nsadi center during the period. So far the site was visited and the program is doing very well as two more beehives have been colonized with bees (these beehives were abandoned during rain season). The farmers have planned to harvest their honey in the month of October and are busy looking for market. The project planned to monitor all the youth clubs of Zikomo project during the period and to encourage them to participate fully as they have received uniform (T/Shirts) from the project. So far all these groups were visited and are performing their duties with smile faces as the uniform has busted their morals. These groups are busy going into villages sensitizing people on dangers of HIV/AIDS through songs, drama and poems. The project planned to monitor the program of hall construction at Likwanya center. So far this program is under way as the communities are at the stage of burning their bricks ready for the second phase of construction. So we are waiting for funds from the donors for the program, as preparatory work is almost completed. See some of the bricks that were molded at Likwanya center for their hall. The project planned to construct a house for Mr. E. Mangani during this period as his house was collapsed last year. The project planned to hire some people to mold bricks but because we do not have enough time for this program, the project has decided to buy these bricks form other people even though it is expensive than molding ourselves. And this program will start once we have funds for it. The project planned to monitor the solar systems that we installed at Nsadi and Nakutepa centers, and to distribute extensions into these centers. So far the program was done as planned and all the centers were visited during the period. In all the centers people are happy with the program and below are some of the people that we met during this visit. Msadi village is in Kawinga project in Machinga District. The village has 1238 beneficiaries from 248 households. The village has been having an acute problem of sourcing solar electricity for a long time. The only source of electricity was Mtaja Trading center which is 8km away from the village. Here is a story of Mrs. Dora James. Mrs. Dora James is 32 years old and has 4 children and she explains on the introduction of the solar system into their village.